'Fortex' is in the house! These tasty pole beans (Phaseolus vulgaris) have clambered up the rope trellises in the raised beds and fruited heavily, paying no heed to the hordes of jabberkneed feebles that find their newly emerging foliage particularly toothsome. These beans grow long without turning tough. With the tips taken off in crisp snaps (...no strings, Ma! ), they're ready to be tossed into a hot pan with a flick of salt, a modest amount of olive oil and an immodest amount of chopped garlic. Keep stirring until the beans green up; keep stirring some more until they dimple and blister; then enjoy: these beans have flavor. 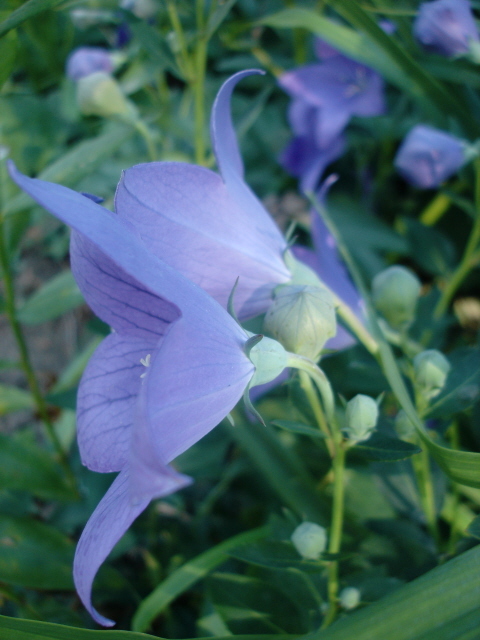 Newly blooming: Anemone tomentosa 'Robustissima' (Japanese anemone); Linum perenne lewisii (blue flax); Machaeranthera tanacetifolia (Tahoka daisy); Clethra alnifolia 'Ruby Spice' (summersweet). Hey, Mom? When are we having courgette blossoms stuffed with mozzarella and anchovies again? Yes. I do have a very rich fantasy life. Although I do hope to have stuffed courgette blossoms (For One) a few times this summer, no arm-twisting is required when this zucchini is put on the plate. It's 'Magda Cousa', a Lebanese summer squash that's growing vigorously and fruiting generously already. It's the most delicious summer squash I've ever tasted. Preparation doesn't have to be elaborate: slice it up in thin half-moon scallops, lightly salted, and then stir it up in olive oil with a few (okay, three or four) coarsely chopped garlic cloves until soft and translucent (folks, don't undercook your zucchini!). When fully cooked, it turns a bright lime green around its edges, and has a nutty, mellow, full flavor. Newly blooming: Panicum virgatum 'Heavy Metal' (switchgrass); Hydrangea paniculata grandiflora 'Limelight'; Humulus lupulus 'Bianca' (golden hops); Salvia forskaohlei (indigo woodland sage). It's been so hot this summer (How...hot...is it? )...anyway, it's been so hot this summer that this early eggplant fruited in record time, even before the tomatoes. 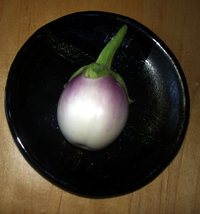 This is the eggplant hybrid 'Purple Blush'. The days-to-maturity figure listed for this variety is 62 days (why not 61? or 63? ), but it's been only about 6 weeks since it was transplanted into the raised beds. This beautiful little specimen has an all-natural gloss (no paraffin required! ), but pricks the unwary with tiny sharp thorns at the base of its stem. 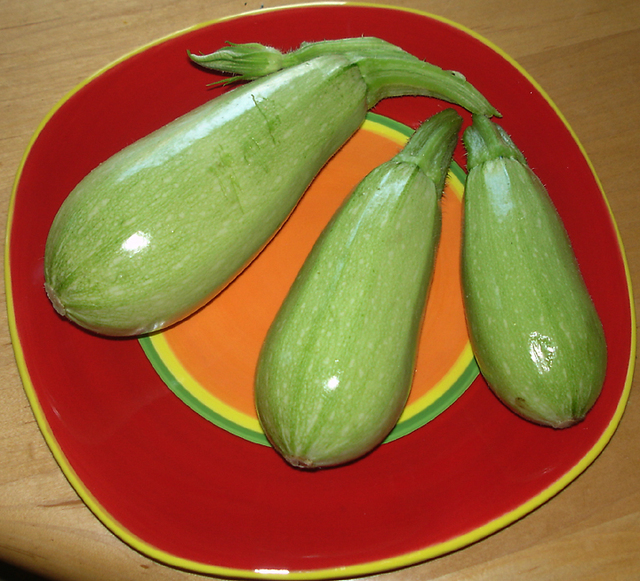 This eggplant is said to have a mild, sweet flavor. I'd like to try it in eggplant pakoras, if I can find a recipe that doesn't require 768 ingredients, 99% of which consist of spices and condiments that can't be found in my cupboards. Don't get me wrong; Indian food is my favorite non-Western cuisine, but when I weigh the prospect of "hours in the kitchen with the mise-en-place spilling off the counters" against "hop in the car to the lunch buffet at Maharajah five minutes away", there's not much of a contest. Newly blooming: Liatris spicata (blazing star); Dracocephalum moldavicum (dragonshead); Hydrangea paniculata 'Grandiflora' (PeeGee hydrangea); Celosia plumosa (self-sown); Coreopsis rosea (pink coreopsis); Papaver rhoeas (Shirley poppy). 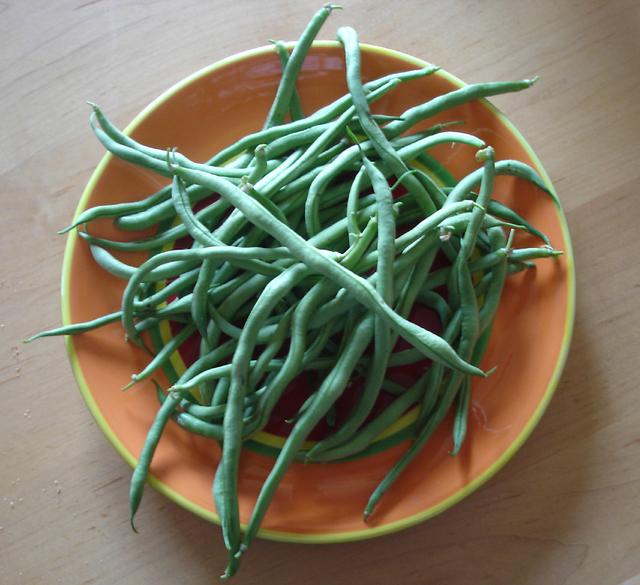 These were the final harvest of the Amish sugar snap peas (Pisum sativum), which bore pods for over a month after blossoming in scentless white pea flowers right around Memorial Day, and twining all the way up a six-foot chicken wire trellis set up like a volleyball net across the raised bed. The peas never quite made their way into the kitchen, though; the pea stand was an outdoor snack bar for my husband, me, and those of our children that eat vegetables. 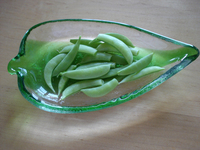 We gobbled up the young peapods (which were crisp, tender and stringless) for a couple of weeks before catching on to the fact that a sweeter treat would be in store if the pod were left to mature just a bit. (Waiting until the pod begins to bulge ever so slightly gives time for the peas inside the pod to contribute to the flavor with no need to shell them.) My twelve-year-old's special snacking technique: split the pod open at the seam, scrape out the peas and eat them first, followed by the pod. (Works great for Oreos, why not for snap peas?) Even with premature hot weather, the pea plants were only just beginning to slow down before I yanked them out to make room for the expanding soybean plants, which have just started blossoming in tiny lavender flowers. I look forward to planting the snap peas again, this time in double rows, next spring. Newly blooming: Buddleia davidii 'Black Knight' (butterfly bush); Phlox paniculata 'Franz Schubert'; Datura stramonium (jimsonweed, self-sown); Melampodium paludosum 'Melanie'; Origanum laevigatum 'Herrenhausen' (ornamental oregano). I've joined the party over at Cold Climate Gardening with the post "My favorite weeds". Thanks for having me, Kathy! And my column for May, "Doing My Share," is up at Saucy. (It includes a bit about another favorite weed, chicory.) The spring farm share I talk about in the column is from Vermont Valley Community Farm, in Blue Mounds, here in Dane County. The newsletters posted on the site will give you a taste of what's been coming home in the spring share boxes. Newly blooming: Azalea (oops, lost track of the cultivar--it has tangerine-colored blooms and, most notably, survived the winter! ); Lamium maculatum 'Beacon Silver' (spotted deadnettle) and a self-sown "sport" of Beacon Silver; Ajuga reptans 'Bronze Beauty' (bugleweed). My new column is up at Saucy. Saucy, the new webzine from Bookslut's Jessa Crispin, is all about food (and includes a column from yours truly this month). Check it out! The title of this post is misleading, because this fennel (the bronze form of common fennel, Foeniculum vulgare) was grown ornamentally. Its dramatic feathery fronds kept their bronze color all summer, and started turning green as the weather got colder. When I pulled this out of the veggie bed, it had a foot-long slender taproot and additional trailing roots almost two feet long. This species of fennel does not form a bulb, and its stalks are as fibrous as sugar cane. 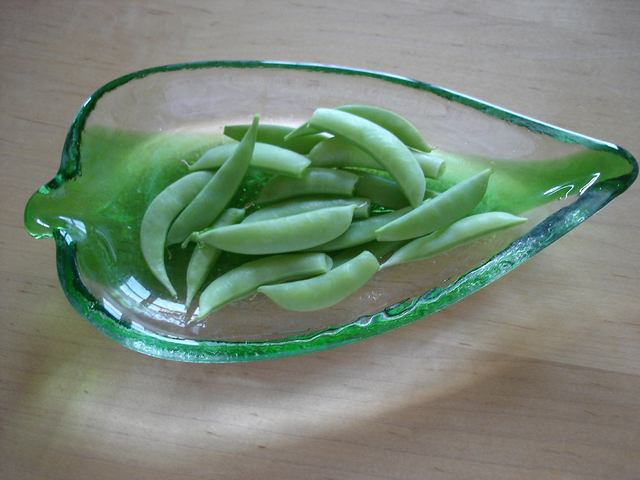 The fronds were strongly anise-scented, so I thought I would try to do something with them in the kitchen. This recipe caught my eye, but it mutated into something quite different by the time I got done with it. First, no fennel bulb, so no braised fennel. Next, sea bass for a family weeknight supper? Nope. My kids need to turn up their noses at something just a little less pricey. So catfish fillets instead. Then, anchovy paste, but no capers? That's strangely deficient. So I substituted a tin of anchovies in olive oil, rolled around capers. Likewise, onions, but no garlic? Hmm, I don't think so. So I turned this into a full puttanesca by starting with onions in olive oil, adding diced tomatoes (canned worked just fine), mashing the anchovies and capers into them, and cooking the sauce down for about ten minutes. Then slivers of a couple of fat cloves of garlic were added, along with a generous sprinkle of red pepper flakes and salt, with the sauce left to cook down some more. The catfish fillets were dredged in salt-and-peppered flour, and placed in the skillet, with the sauce scooched aside, to cook for four minutes on each side with the skillet covered. A couple of fronds of the fennel were placed on top of the fish, and turned a rich dark green after cooking, but didn't contribute any detectable flavor or aroma to the dish. My husband, who doesn't like cooked fish (for the most part, I'm with him, my ideal fish dish being a sashimi-grade catch, passed quickly over a candle flame, but I grant special dispensation for catfish and, on special occasions, sea bass), opted out in favor of frozen pizza, and my son, who doesn't like anything other than p.b. sandwiches and pizza, joined him. My eleven-year-old had a bit of both, and my five-year-old had seconds, then thirds, of Mom's new favorite fish dish.